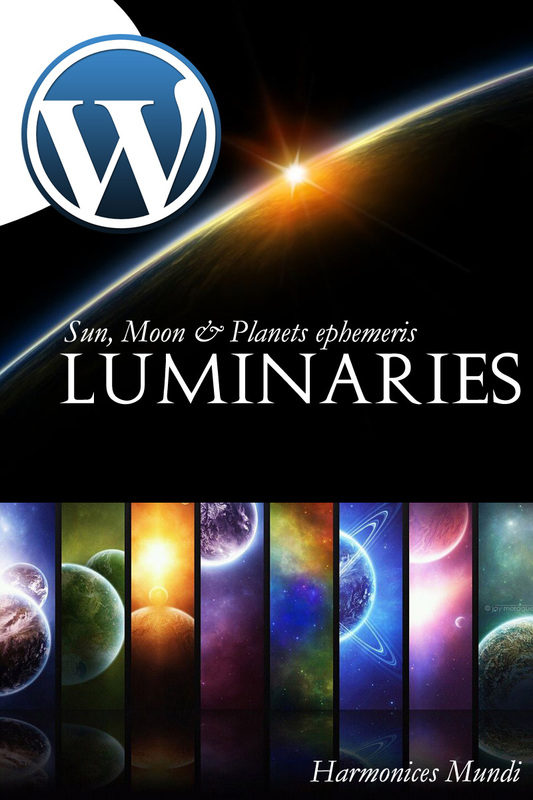 Luminaries combines the beauty of a simple design, to the general and technical information you might want to know and show to your users regarding the Sun, planets and the moon in real time. Current moon phase, with medium resolution image. 140 different color templates allow you to adapt it to your website design. Technical and general details for the moon, like age (in days), iluminated fraction of the disk, phase percentage, distance, angular size (in arcseconds), name of the phase and the Sun, moons, ascending node & planets (Mercury to Pluto) ecliptic position and equatorial declination. Previous and next phases: Luminaries also displays the five major phases dates around your current time, in a cycle from one new moon to another. Rise/Transit/Set of the Sun and moon at Greenwhich. Ability to show only the planets data, planets plus moon, or all. For universitaly, times are all in UT (universal time) referred to Greenwhich.